Are you a Member yet? JOIN NOW to support the Des Moines Rehabbers Club! At some point during the renovation design process, it will be time to start locating a general contractor and/or subcontractors to perform required work. By this time, you should have already decided whether you will serve as general contractor or hire a general contractor to manage the project. If you are hiring a general contractor, there are two approaches Design+Build or Design-Bid-Build. The first approach is to find a trusted general contractor to work with you through the design process. Allowing the general contractor to have input in the budgeting and design process and may lead to savings if he or she can have input into materials and methods/details early in the process. There will also be a time savings because you won’t have to wait for multiple contractors to bid the project from the completed construction documents. However, you have to trust the contractor to be fair and transparent in pricing. The second approach is to competitively bid the project to two or more contractors. This approach requires you to have a complete set of construction documents in order to ensure you are comparing equivalent scopes of work. If different contractors are making different assumptions, you will be unable to compare the bids side-by-side. It is not necessarily best to take the lowest bid – you make sure that the bid you accept is including all the work you want done and that the quality of work will be acceptable. Get recommendations from friends or other trusted sources. Contact companies and arrange times to meet potential contractors at the house for a walkthrough. If you take a day to meet multiple contractors, schedule them with enough time so that contractors from the same trades do not overlap. Compare bids side-by-side and ask for clarification if necessary. Be aware of vague language and get all dates and costs in writing. Make sure you get along with the contractor and do not have any immediate communication problems. Your design professional can assist in the contractor selection process by providing preliminary drawings, evaluating bids, and answering questions. Verify that all contractors you work with are licensed and insured for your project. Insurance covers injury to workers on site and damage to property caused by the contractor – your basic homeowner’s insurance policy may not be appropriate coverage for construction. You may request that the contractor furnish you with a “certificate of insurance”. This certificate should be faxed or mailed directly from the insurance company and reference your specific name and address. Do not accept any other proof of insurance. A lien is a legal encumbrance on the deed to a property ensuring that it cannot change hands until the lien holder is paid. As you make payments to your contractors throughout the construction process, always request signed lien wavers. If you are working with a general contractor, ask for signed lien waivers from all subcontractors before releasing the final payment. The lien waiver ensures that you cannot be “double-billed” for services. For example, consider a draw payment submitted by the general contractor that includes the electrical rough-in. 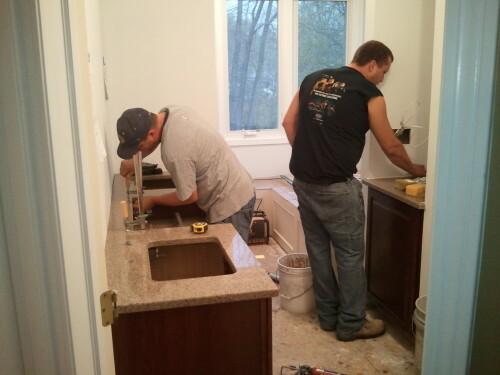 You pay the general contractor and assume that the electrician gets paid subsequently. However, if for some reason the electrician does not receive the money owed, he or she can place a lien against your property for that amount. In order to release the lien you could end up paying for the same work twice. The Des Moines Rehabbers Club is a non-profit group dedicated to revitalization in Des Moines through renovation, preservation, and maintenance of historic buildings.